11.5x9x7 mm / 3 ct. with fair clarity and rainbows. 12.5x7.5x6.5 mm / 4.25 ct. excellent clarity. 12.5x9.5x8.5 mm / 4.7 ct. sharp tip part cloudy part clear. 12.5x10x7 mm / 5 ct. cloudy. 12.75x8x7 mm / 4 ct. with double tips and water clear. 13x11x8 mm / 6.7 ct. with good clarity and round shape. 14x8x7 mm / 4 ct. with good clarity & sharp points. 14.5x9x8 mm / 5.5 ct. sharp dt's & good clarity. 16x10x7.5 mm / 7.6 ct. with excellent clarity. 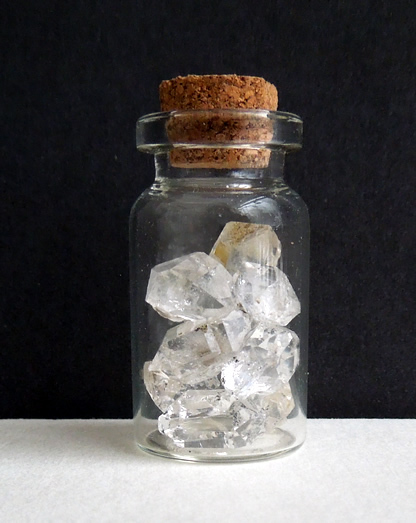 The cork to glass vial holds the crystals securely when not viewing. A great group for crystal collectors or healers ! 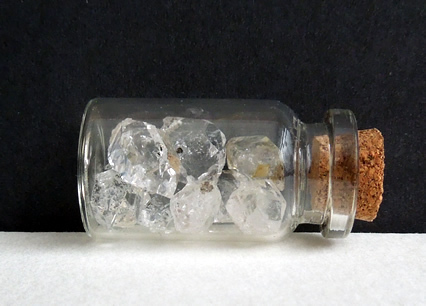 Group of Herkimer quartz crystals in a glass vial.